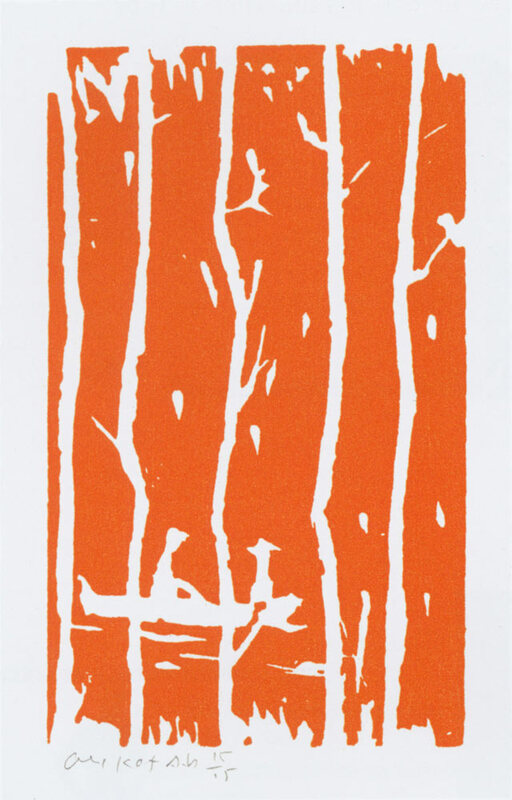 Toward the end of the Albertina’s beautiful new catalogue raisonné of Alex Katz prints there is a simple image, just orange ink on white paper framing the silhouette of a rowboat on still water, glimpsed between narrow tree trunks. Maine Landscape 2 (Fig. 1) is classic Katz—elegantly reductive, formally rigorous, slightly wistful in flavor. A closer look reveals that the edges are somewhat rougher, the line a bit choppier, the whole a bit cruder than the other prints reproduced on the page. In fact, Maine Landscape 2 (cat #433) is a replica of a linocut Katz made more than 50 years earlier (Maine Landscape, 1951/52, cat #3), now recast as a heliorelief woodcut.1 The remarkable thing, however, is not how the replica differs from Katz’ late work, but how almost seamlessly it fits in. Among deeply respected contemporary artists, Alex Katz is distinguished by a quality of stasis, not just in terms of his subject matter—frozen figures, frozen landscapes, frozen light—but in terms of his stylistic development. After a brief experimentation with more gestural modes, Katz hit his stride in the mid-1960s, and has changed almost nothing fundamental about his process, interests, or visual style since. In most art careers, this would be evidence of a thinness of ambition or inventive genius, but in Katz’s case it denotes a purposeful trajectory of ever-morerefined precision. To Katz’ detractors, this confirms his status as a stylish but ultimately decorative chronicler of a certain kind of privileged American life; to his supporters it marks him as a profound investigator of perception and the emotional resonance of form—Ellsworth Kelly with figures. For those who have yet to stake a position, the Albertina catalogue, covering 64 years and including many of Katz’ most famous images, offers a profusion of material that will encourage a decision. Fig. 1. Alex Katz, Maine Landscape 2 (2005), heliorelief woodcut, torn edges, image 16.6 x 9.9 cm, sheet 19 x 12 cm. Edition of 100. Printed by Tom Pruitt, published by Graphicstudio, Tampa, FL. The Albertina in Vienna owns a number of important paintings by this distinctly American artist, and it was to the Albertina that Katz gave his archive of prints, the basis for this impeccably produced catalogue. Nearly 500 works made between 1947 and 2011 are listed and reproduced, in addition to an appendix of 31 further publications of “reproduction graphics,” (mainly books of poetry with images by the artist.) The book also contains essays on Katz’ collaborative relationship with printers (by Vivien Bittencourt) and poets (by Vincent Katz), and two interviews—one a reprint of a 1983 conversation between Katz and the poet and art critic Carter Ratcliff, the other conducted by the catalogue authors Marietta Mautner Markhof and Gunhild Bauer. The catalogue itself opens with two cartoonish drypoints from the late 1940s made when Katz, still a student at Cooper Union, received some printmaking tips from Bob Blackburn. By the third print, the 1951 Maine Landscape, the rudiments of Katz’ mature style are already in place. 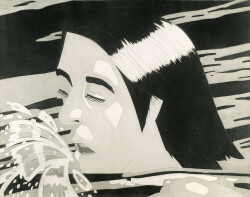 Katz describes the linocut as his attempt at Pollock-esque all-over composition, but the rowboat is distinctly un-Pollock. For a couple of years he continued to experiment with linocuts and stencils, which seemed to offer a path toward a purer kind of flatness. Once he found a way to produce that flatness in painting, however, he stopped making prints almost entirely for a decade. Fig. 2. 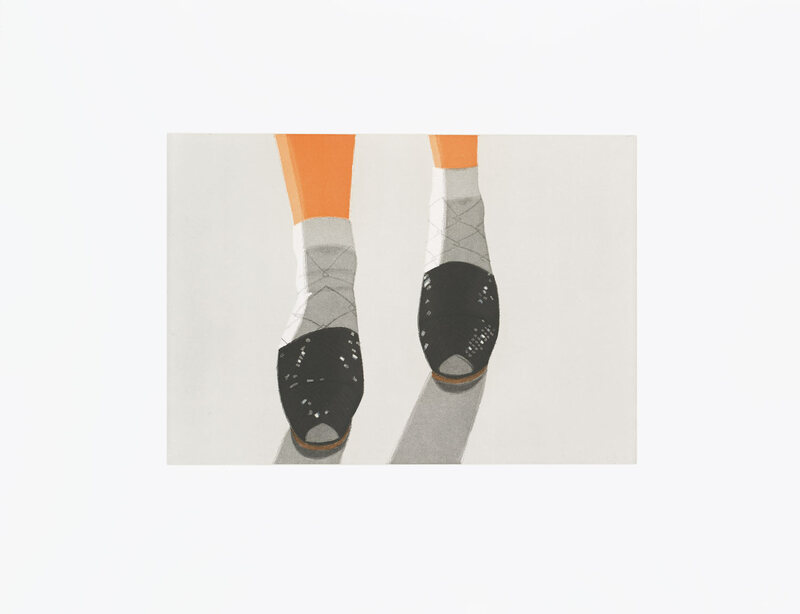 Alex Katz, Luna Park 1 (1965), screenprint in six colors (tusche) on Becket Cover Stock paper, cut edges, image 91.4 x 75.8 cm, paper 103.8 x 79.8 cm. Edition of 30. Printed by Steven Francis Poleskie, Chiron Press, New York, published by Fischbach Gallery, New York. Katz’ argument neatly reset the terms of “the original print” by separating reproduction (mechanical and lifeless) from repetition (the remaking and refining of an earlier image). In fact, Katz’ whole process for making art progresses through a series of replications and distillations: a thought or observation takes form as a sketch, which is refined and enlarged into a big cartoon, which becomes the guide for a painting. The painting part itself often takes less than a day. The print is simply the next, logical transformation. Flipping through the print catalogue raisonné is thus something like roaming through a career retrospective: there are the quiet, summery landscapes and big bright splashy flowers of the late 60s, followed by the famous portrait heads of the 70s, close-cropped and therefore seemingly enormous even at print-on-paper scale. Couples appear in the 80s, and a spate of waterscapes in the 90s. All are depicted through resolutely reduced means: a handful of colors demarcated with precise and eloquent edges. Fig. 4. Alex Katz, Black Shoes (1987), aquatint and vernis mou (five colors and four plates) on Somerset Satin paper, deckle edge top, torn edges sides and bottom, plate 30.1 x 42.9 cm, paper 57.2 x 73.3 cm. 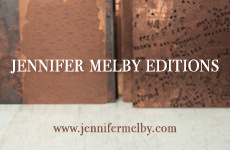 Edition of 60. Printed by Doris Simmelink, assisted by Chris Sukimoto, Mark Callen and Pam Paulson, published by Crown Point Press. Luna Park was done as a screenprint—the obvious way to get the broad flat color shapes of his paintings—but Katz quickly moved to lithography and etching, with their very different luminosities and surface properties. Over the course of the 1970s we watch as his approach to prints moves from pragmatic to masterful. By 1982, he was making five-foot tall multi-color aquatints that look neither like his paintings nor like any prints made before. 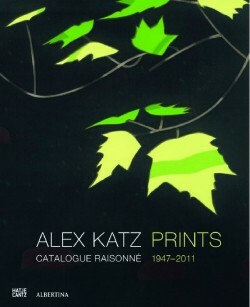 I don’t believe the absolute quality of Katz’ prints qua prints is under serious dispute. He has worked with some of the best printers on earth, and knows how to get what he wants from them. (Bittencourt quotes Doris Simmilink, Tom Pruitt, Chris Creyts, and Bob Blanton on Katz’ technical adventurism as well as his perfectionism.) 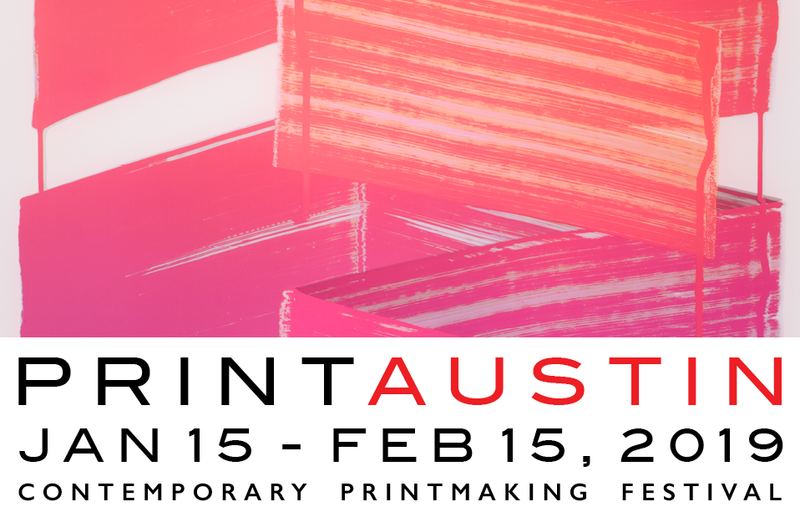 Technically and visually, the best of these prints are simply spectacular. What bothers Katz’s critics is the purposefully superficial handling of a purposefully limited subject matter. Let’s be honest—this cleanly limned world of waterfront leisure and successful people with nice accessories can seem annoyingly smug. When viewed en masse in a catalogue, the insularity of the enterprise stands out more than it does in the presence of the actual artwork: we see the same people again and again—the artist, his wife Ada, their son and their daughter-in-law (who contributed the two essays to the catalogue), their friends. The women are all pretty, the men are mostly poets, and everything is offered up without irony, critique, or psychological complexity. It’s like a Gatsby summer in which the fall (in both senses) never comes. The question is not whether these images are superficial—they are—it is whether that superficiality serves some larger purpose or not. Alex Katz, The Swimmer (1974), aquatint on German Etching paper, torn edges, 71.3 x 91.4 cm. Edition of 84. Printed by Prawat Laucheron, New York, co-published by Brooke Alexander, Inc., New York, and Marlborough Graphics, Inc., New York. Katz is not unaware of the potential pitfalls of his manner. At one point he observes, “the distinctions between illustration and painting are muddy. And the edges between decoration and beauty are not clear either, because all beautiful things are a little decorative.” Note that he does not deny either beauty or decoration. 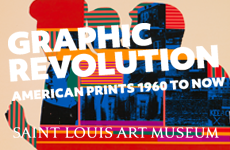 In the interviews, Katz discusses hundreds of individual prints specifically and by name. This is a welcome change from the generic recall that frequently causes such efforts to read like post-game interviews (“You can never know what can happen when you get in there with the press, but we went in feeling confident and the printers really came together and worked hard, and we were able to do really well…”.) He happily goes into print-geek depth on color separations or the use of litho crayon to create a soft edge for an aquatint block. He is enthusiastic (exclamation points abound!) and strongly opinionated about things like the beveled indentation made by the edges of intaglio plates: “the artiness of the gutter, the sensuality of the gutter, and the materialism of the gutter always offended me.” He is generous in acknowledging the contributions of printers (Aldo Crommelynck, Simmelink, Chris Erickson, Tadashi Toda, among others), and his conversation is riddled with art historical allusions: Velasquez’ difficulties with horse anatomy; the tightness of Veronese’s drawing; Giacometti’s sense of scale; the chromatic power of Piero della Francesca. In other words, the how of representation—color, weight, surface, scale, process—are topics of lengthy disquisition. But the what being represented is never discussed. When mentioned at all, subject matter is cited not for its inherent meaning but for its role as the opening gambit in a visual chess game. The subsequent moves are what interest Katz, how he can use color and shape to manipulate the way the mind fills in and alters perceptual data. Fig. 3. 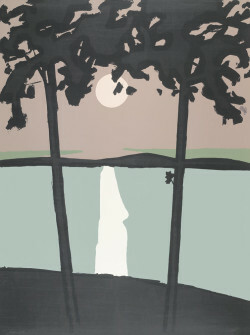 Alex Katz, Brisk Day (Woodblock), Brisk Day (Aquatint), and Brisk Day (Screenprint) (all 1990), sheet size for each ca. 36 x 29 inches, editions of 150 each. Woodblock printed by Takanaka, Kyoto; aquatint printed by Simmelink / Sukimoto Editions; screenprint printed by Styria Studio, Inc., New York. All published by Gjon Inc., Kyoto. Throughout his career, Katz has been closely involved with poets and poetry, especially that of the New York School, with its characteristic careening between the offhand and the profound. It’s a quality that is also found in Ukiyo-e woodblocks—the everyday world made harder, brighter, more numinous, while remaining seemingly effortless and circumstantial. Katz is particularly drawn to Utamaro, the quintessential chronicler of domestic glamour: “Utamaro… is bohemian; he lives in the same world I do.” It’s an apt comparison: we do not look to Utamaro for a sense of the psychological life of his sitters; we don’t expect social commentary on the Tokugawa shogunate. We look to Utamaro for the pleasure of a perfectly artful composition depicting some quite ordinary event. And that is a quality that Katz achieves again and again throughout these pages in images as simple as Black Shoes (Fig. 4), a perfect small observation, polished and presented as if in a locket for all eternity, and it’s enough to break your heart. Fig. 5. Alex Katz, Triptych: Northern Landscape—Fog, Night, Bright Light (1992), color woodcut on Hosho paper, handtorn, image 45.5 x 35.3 cm, paper 50.7 x 40.4 cm. Edition of 100. Printed by John C. Erickson, New York, published by Chalk and Vermilion Fine Arts, Greenwich, CT.